Dinosaurs have always fascinated me. I thrilled to "One Million B.C." with Raquel Welch and the great animated dinosaurs. To be completely accurate, dinosaurs have been extinct for 66 million years, so the movie's title is off by a few million years. Of course, everyone knows people didn't live during those days either, but I liked the movie in spite of its errors. Interest in the dinosaurs is bigger today than ever. Just look at the success of such movies as "Jurassic Park." More new findings and species are being dug up now than ever before. I guess the popularity of dinosaurs is due to the fact that these kind of amazing creatures actually existed. Over the years, theories have changed, discoveries have been made, and science has given the dinosaurs a makeover. Once thought to be cold blooded, sluggish reptiles, the image of dinosaurs today is one of vital, hot-blooded beasts, much more dramatic than the plodding behemoths of my youth. Somehow, in my mind, I must have always known this to be true. How could these creatures have captured my imagination so completely? How could they have dominated the earth while other animal forms hid in the shadows? Rather than being the evolutionary failure most people stereotype them as, they are, on the contrary, one of the most successful forms of life to have come along. Their kind ruled the earth for 155 million years, while people have been around for perhaps 4 million (modern humans even less). Descendents of the dinosaurs live among us today in the form of birds. Dinosaurs lived in a block of time called the Mesozoic Era, which began about 248 million years ago an lasted 182 million years. The Mesozoic era is divided into three smaller blocks of time called Periods. 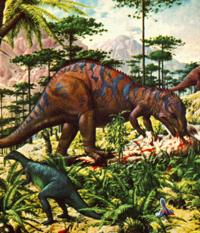 The earliest period was the Triassic, which lasted from 248 million years ago to 208 million years ago. This period saw the beginning of the dinosaurs (towards the end of the period), and was actually dominated by other animal forms that, at the time, were larger and more numerous than the primitive dinosaur forms. Next came the Jurassic Period, which lasted until 144 million years ago. This was the age when dinosaurs really took over, with animal forms reaching immense size and incredible shapes. The first bird forms are believed by most paleontologists to have evolved in this period. The last age of dinosaurs was the Cretaceous Period, which started 144 million years ago and lasted to 66 million years ago. Some of the most familiar dinosaurs forms evolved and lived during this time, including the ceratopians (Triceratops), and hadrosaurs (duck-billed dinosaurs). Probably the most famous dinosaur of all, Tyrannosaurus Rex, lived during this period. At the end of the Cretaceous period, all fossil evidence of the dinosaurs disappears. Throughout Earth's history species have vanished during happenings called mass extinction events. All through the history of the earth, including the Mesozoic Era, and Cenozoic Era (the age of mammals, which includes the present day), mass extinctions have wiped out many forms of life, which were then replaced by other forms. The mass extinction event at the end of the Cretaceous wiped out many forms of life, including the dinosaurs, pterosaurs, and the huge marine reptiles. What caused these extinctions is still in dispute, and may never be truly solved. The most recent popular theory is that the extinctions were triggered by a large asteroid or comet smashing into the earth's crust. Dinosaurs were a group of animals, now extinct, which lived during the Mesozoic Era. Some were quite small, chicken or dog sized, while others reached incredible size, becoming the largest land animals to exist on the earth. Although they are called reptiles, most scientists today believe that at least some dinosaurs were warm-blooded. Fossil evidence indicates that they laid eggs, and some may have fed their young by bringing food to their nests, as birds do today. They ruled the earth for about 155 million years, finally dying out 66 million years ago during a mass extinction at the end of the Cretaceous Period. Dinosaurs came in two forms or groups. One group is called saurischia(reptile-hipped), which includes the theropods (all carnivorous dinosaurs were theropods), and the sauropods (the largest of all land animals were sauropods). The other group is known as ornithischia (bird-hipped), and all species in this group were herbivores. The ornithicians can be further divided into five sub-groups, the ankylosaurs (armored dinosaurs), ceratopians (with parrot-like beaks, most had bony shields and horns), ornithopods (which include Iguanodon and the duck-billed dinosaurs), pachycephalosaurs (similar to the ornithopods, but with bony, domed heads), and the stegosaurs (another armored group, with bony back plates and spiked tails). Interestingly, birds seem to have developed from the reptile-hipped group (specifically, the theropods). Dimetrodon was a dinosaur-like creature that lived in the Permian Period at the end of the Paleozoic Era. A flesh eater, it was more closely related to mammals than to dinosaurs, which didn't evolve until millions of years later. Pterosaurs were a group of reptiles that developed a thin membrane of skin that stretched from elongated fingers to its back legs, allowing them to fly. Evolving from a group of early archosaurs during the Triassic Period, they existed for longer than the dinosaurs, finally dying out in the mass extinction event at the end of the Cretaceous along with the dinosaurs. Birds did not evolve from pterosaurs, as some may believe. The marine reptiles were a varied group that lived in much the same ways as whales and dolphins do today. Ichthyosaurs, plesiosaurs and mosasaurs ruled the seas and oceans as the dinosaurs did the land. The ichthyosaurs in particular were incredibly dolphin-like, even giving birth to live young while swimming in the oceans.